Despite surly weather forecasts and conditions, this year's Keyesville Classic was an astounding success. Top pro's, a beautiful new staging area, over 2 miles of new single track, a challenging and fast downhill, beer can jousting, dirt jumping teletubbies and free beer from the Kern River Brewing Company created the best vibe this event has seen in years. The turnout for this year's event was well up over last year, thanks to all the dedicated racers, volunteers and vendors who braved the weather. Friday rain made for a fast and tacky XC course, but the rain held off for Saturday's XC race. Sunday saw some drizzle and showers, but not enough to dampen anyone's spirits. At one point a powerful wind gust sent vendor EZ-up tents flying across the short track race course. Two note-worthy Pro's this year were Adam Craig and Tinker Juarez who took 2nd and 3rd in the Bionicon All Mountain Stage Race behind Champion Jim Heweit. Graeme Pitts, rockin' his USA skin suit put in an outstanding race run to win the Pro DH just 1.5 seconds ahead of Adam Craig. Vincent Lombardi took the Cross Country, and Tinker hammered to a convincing win in the Short Track. All made for a great showing of professional talent. The new, more open staging area allowed for more vendors than previous years, and gave the 23rd Keyesville Classic a much more festive feel. Along with the new staging area, over 2 miles of fresh new singletrack was added to the XC course, eliminating the dreaded Pearl Harbor road climb. While the new singletrack was still pretty raw, racers reception to it was overwhelmingly positive. "I had a great time at this event and in the surroundings around Lake Isabella, with the Kern River, snow topped mountains and a hundred trails as far as the eye could see," said Tinker Juarez about his first time in Keyesville. "I'll come back again no problem," he continued. This year's DH course was fast and furious, with shuttle access, newly built berms, singletrack and a new center of attention, the Slab. DH racers launched off a granite slab into a maze of padded trees, looking for the fastest line. This was all possible with the support of our local BLM office who are willing to help us make Keyesville a major mountain biking destination. We are continuing to work with the BLM to make the new singletrack a permanent addition to the trail system. Plans are also in the works for more single track on the XC course next year, and a new DH race trail and Super D course for the future. The future and growth of the Keyesville Classic and the Kern River Valley are looking bright thanks to all of the hard working and hard racing people who are making it happen. Check out the Keyesville Classic Facebook page and website for pictures, videos and comments on CBO's Beer Can Joust, the dirt jumping teletubbies and all the awesome race action. 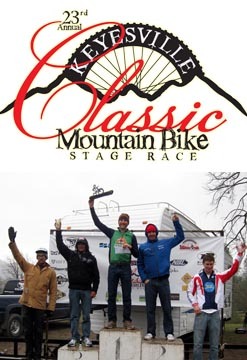 See you at the 24th Annual Keyesville Classic Mountain Bike Stage Race. It will be even better! !